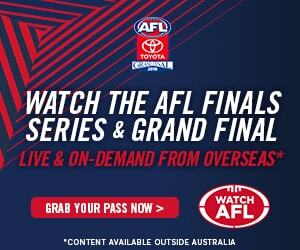 2018 AFL Grand Final day is here. The Grand Final kicks off today at 2.30pm Melbourne time with the West Coast Ealges taking on Collingwood at the MCG. The full broadcast schedule for the day including Match Day, the Pre-match entertainment and post match Highlights show can be seen below. Note what is shown in each region varies.